Report by Dust Control Technology chief executive officer Edwin Peterson is sharing his thoughts about renting or owning your dust suppression equipment. For close to a decade PDi has in each issue published columns from the different branch associations in our industries. 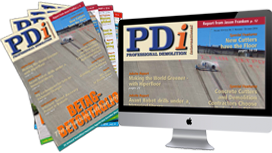 For the key persons within the associations it is quite a challange to have something new to say in each issue of PDi. That is why we would like to try something different now where we welcome anyone to contributed under the title Open Column. There are no limitations of columns or subjects and the word is free. You will for sure receive message for the branch association too but not in ever issue. In our first column a well-known name starts out, John Woodward, former president of Institute of Demolition Engineers.